Ht / Wt: 5'10" / 198 lb. 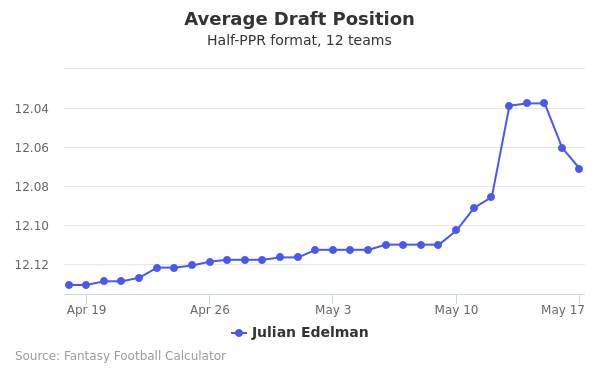 Julian Edelman's fantasy value is measured by his average draft position (ADP) in fantasy football mock drafts. 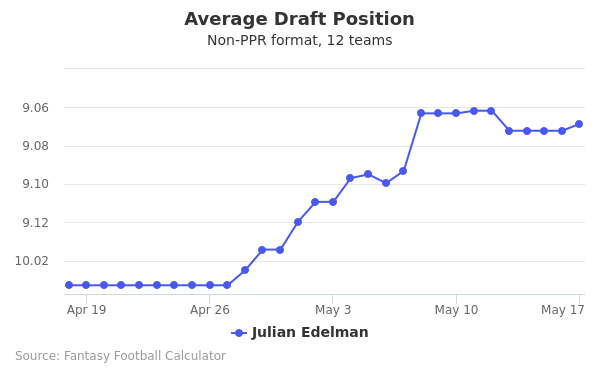 In recent drafts, Edelman's current ADP is 5.01, which indicates that his fantasy outlook is to be the 1st pick of the 5th round, and 48th selection overall. 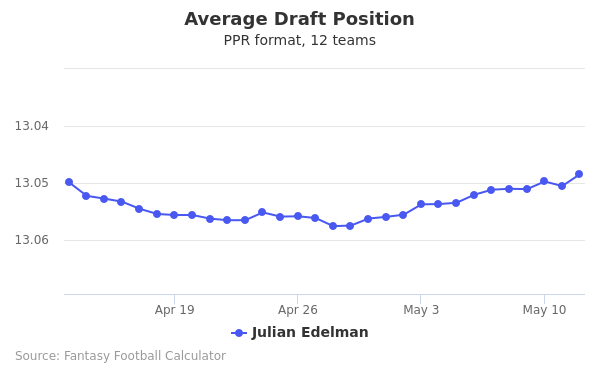 The code below will display a graph that updates every day to show the ADP data for Julian Edelman for the past 30 days in 12-team PPR leagues. Draft Julian Edelman or Tarik Cohen? Draft Baker Mayfield or Julian Edelman? Draft Jarvis Landry or Julian Edelman? Draft Alshon Jeffery or Julian Edelman? Draft Julian Edelman or O.J. Howard? Draft Julian Edelman or Tyler Boyd? Draft Julian Edelman or Tevin Coleman? Draft Julian Edelman or Kenyan Drake? Draft Julian Edelman or Will Fuller? Draft Deshaun Watson or Julian Edelman? Draft Chris Godwin or Julian Edelman? Draft Evan Engram or Julian Edelman? Draft Calvin Ridley or Julian Edelman? 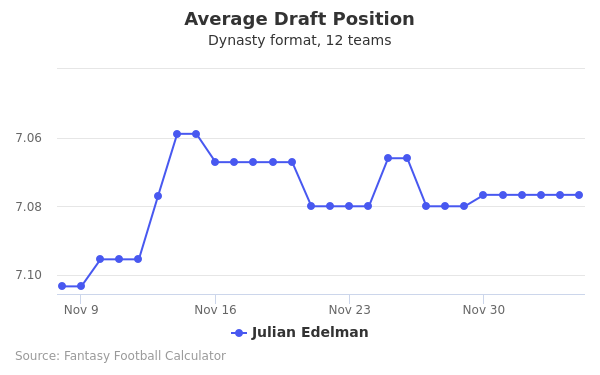 Draft James White or Julian Edelman? Draft Julian Edelman or Mike Williams? Draft Hunter Henry or Julian Edelman? Draft Julian Edelman or Lamar Miller? Draft Doug Baldwin or Julian Edelman? Draft Jordan Howard or Julian Edelman? Draft Julian Edelman or Russell Wilson? Draft Julian Edelman or LeSean McCoy? Draft Julian Edelman or Tyler Lockett? Draft Drew Brees or Julian Edelman? Draft David Njoku or Julian Edelman? Draft D.J. Moore or Julian Edelman? Start Julian Edelman or Tarik Cohen? Start Baker Mayfield or Julian Edelman? Start Jarvis Landry or Julian Edelman? Start Alshon Jeffery or Julian Edelman? Start Julian Edelman or O.J. Howard? Start Julian Edelman or Tyler Boyd? Start Julian Edelman or Tevin Coleman? Start Julian Edelman or Kenyan Drake? Start Julian Edelman or Will Fuller? Start Deshaun Watson or Julian Edelman? Start Chris Godwin or Julian Edelman? Start Evan Engram or Julian Edelman? Start Calvin Ridley or Julian Edelman? Start James White or Julian Edelman? Start Julian Edelman or Mike Williams? Start Hunter Henry or Julian Edelman? Start Julian Edelman or Lamar Miller? Start Doug Baldwin or Julian Edelman? Start Jordan Howard or Julian Edelman? Start Julian Edelman or Russell Wilson? Start Julian Edelman or LeSean McCoy? Start Julian Edelman or Tyler Lockett? Start Drew Brees or Julian Edelman? Start David Njoku or Julian Edelman? Start D.J. Moore or Julian Edelman? Julian Edelman is a wide receiver for the New England Patriots and he has become a favorite target of future NFL Hall of Fame quarterback Tom Brady. Edelman wears jersey number 11. Edelman was born and raised in Redwood City, California. He played quarterback for the Woodside High School Wildcats football team in nearby Woodside, CA. His senior year, the Wildcats went undefeated with a 13-0 record. During his career at Woodside, Edelman threw for 2,237 yards with 29 touchdowns. He also ran for 964 yards and 13 touchdowns. Edelman started his college career at the College of San Mateo. He threw for 1,312 and 14 touchdowns while also rushing for 1,253 (a school record) and 17 touchdowns. He left the College of San Mateo after his freshman year and transferred to Kent State. In Edelman’s three-year career at Kent State, he passed for 4,997 yards, rushed for 2,483 yards, and scored 52 touchdowns. As a senior, he also caught 6 punt returns for 25 yards. The NFL scouts overlooked Edelman’s quarterbacking career and instead rated him as a wide receiver coming out of college. He was rated as the 56th best WR out of 306 WR’s eligible for the draft. Edelman was also invited to New England to have a private workout before the 2009 draft. The New England Patriots used its seventh round pick to draft Edelman. He was originally projected to be a punt/ kickoff return specialist and a spare QB during training camp. Edelman missed the first game of the season because of an ankle injury, but he made his presence known the following week with 8 catches for 98 yards against the New York Jets. Edelman also had 38 yards on kickoff and punt returns. Edelman added another 13 catches to lead all rookies before breaking his arm in a game against the Tennessee Titans. He didn’t play again until November 15th. Edelman primarily played on special teams where he averaged 15.3 yards per punt and kick return. He had 37 catches for 359 yards and a touchdown on offense. He added another 6 catches for 44 yards and two touchdowns in the Wild Card game. Edelman was again relegated to special team service where he had 584 yards on 40 punt and kickoff returns. However, due to injuries, he got a chance to play in the secondary as a defensive back in several games. Edelman caused the fumble on the Ravens last drive to preserve the win for the Patriots that sent the team to Super Bowl XLVI. Edelman finished the season with 21 catches for 235 yards and 301 return yards on kickoffs and punts. With his rookie contract ended, Edelman signed a one-year deal to stay with New England. He finished the year with 105 catches for 1,056 yards and 374 yards on 35 punt returns. New England rewarding him with a four-year contract with an average yearly salary of $4.25 million. Edelman started 14 games for New England and ended up catching 92 passes for 972 yards. In the Super Bowl that year, Edelman had 9 catches for 109 yards. Edelman’s season was shortened due to a foot injury, but he still had 61 receptions for 692 yards with 7 TD’s. He ended up being designated as the 87th best player in the league in the NFL’s Top 100 Players. Edelman had 98 receptions during the regular season for 1,106 yards. Edelman finished the season by making a spectacular catch to keep New England’s game-tying drive alive in the Super Bowl. New England won the game 34-28 against the Atlanta Falcons in overtime.